Corner landscaping includes groupings of plants used to “anchor” the corners of a house or other structure. In addition to such “foundation plantings,” corner landscaping also includes areas difficult to landscape, such as where two fences join together or where a house meets a fence. Use plants at the corners of buildings and other structures to blend the lines of the wall and ground and create transitional zones of interest. 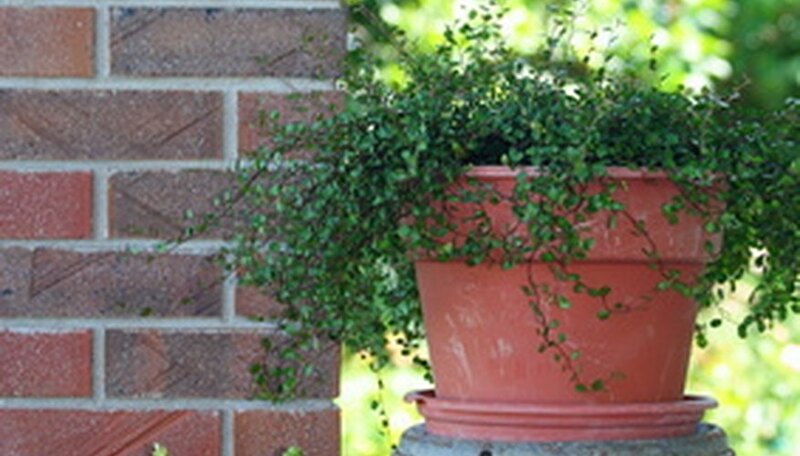 A corner foundation planting should not grow higher than two-thirds the height of the eaves, according to cooperative extension literature published by Alabama A&M and Auburn universities, although this is not a strict rule. However, group plants from high to low and low to high to move the eye accordingly throughout the landscape planting. Some shrubs, like Italian cypress (Cupressus sempervirens), are upright and narrow, which makes them perfect for framing and for use as a strong accent specimen in a formal landscape. In areas where nothing grows well, or in unused corners of patios and porches, groupings of containers create pockets of color. Group tall plants or shrubs at the back of the corner and colorful summer bedding plants at the front, mixed with foliage plants for their interesting leaf colors and textures. In corners with poor soil, make beds of contrasting color gravel and use terracotta pots of various shapes and sizes, with bright summer annuals in the warmer months and pansies and bulbs in fall and spring. Or use evergreen plants and small shrubs in containers for year-round color and textural interest. Use decorative containers in small corners, such as a decorative urn on a tall pedestal with a cascading plant and a cluster of small pots placed beneath it. Individual small containers don't have a lot of impact, but grouped together, they become a focal point. If space allows, a dwarf variety fruit tree grown in a sunny patio corner brings color, height and the added benefit of fresh, seasonal fruit to the landscape. Remember that container-grown plants need more irrigation attention than plants grown in the ground. Large containers require less watering than smaller ones, and some are designed with better water-holding capacity than others.